As webOS grows up, developers learn more about the platform, and together we build commonality into our apps. I have talked about various gestures and practices that are both built in, and have emerged. I have seen some very interesting advanced uses of our notification system recently and wanted to share. First up is birdwatch a “background app” that polls your Twitter account and when new tweets come along, they are shown in a dashboard component at the bottom of the screen. You can simply tap that area to move through your tweets. Very nice indeed, and something I would love to see in our email client, and in the Facebook app. The feature has been added to our list. It is a great and simple example of how you don’t need a full app for every use case, and remember: those areas are DOM windows too so you can make them do a lot! We have seen other core examples such as the media player controls, and I also look forward to seeing the Facebook app be able to accept/deny friend requests right there. What would your users want to do rather than be sent into the main app indeed? That is the question. Then we have Jot It, a note taking application. What makes it different is again in the dashboard area. When the dashboard is activated you see a bottom UI bar that gives you quick access to your documents. A creative way to add the UI. Back to Twitter. I have really been enjoying Tweet Me a new application that just got released into the catalog today. One feature that fits into the notifications meme is the banner notification UX flow. If you type in a tweet and back gesture away instead of a dialog “are you SURE you want to leave that info?” the app does something very nice indeed. It saves a draft AND gives you the option to delete that draft right in the banner. It’s a small thing… but one of those touches that shows that the developer really sweats the small stuff. I am really excited about this application in general. 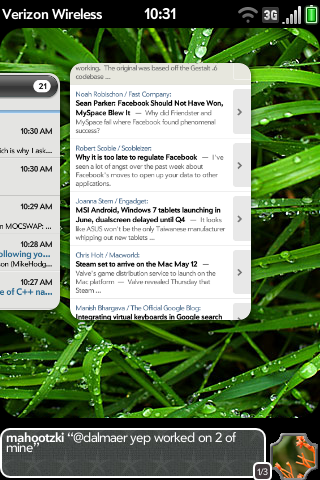 It is beautiful and really showcases how webOS apps can be gorgeous. 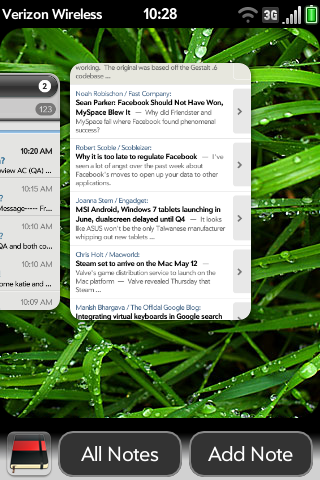 The technology is there, and this app raises the bar for all webOS applications. 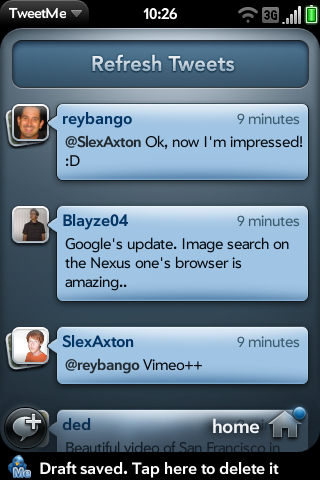 Man, we have an amazing set of Twitter apps now. They each have their own feel and niche too. Bad Kitty is fantastic. And then there are Tweed and Twee and Spaz (fully open source) ….. the list keeps growing. A strong bench. What other mobile apps are inspiring to you? Other practices? Good points Dion… what you describe in birdwatch is also what I did in my Twitter Monitor app in my book (the one that I didn’t wind up getting into the catalog)… it shows you the most recent tweet by the people you’re following and also provides an icon to click to jump into the app into the appropriate spot. I think what Jot It does is especially interesting because it effectively makes the dashboard very similar to Windows 7’s jump lists. I could see that paradigm becoming more prevalent as developers recognize the potential it has. I’ve really been enjoying notifications of friends’ checkins in the foursquare app (maybe just the beta for now?) I almost never open the app just to see where everybody is, so this is a nice way to keep track of my friends.